How do You Flip a Class? This guide is designed to walk you through the steps of flipping a single class; the process is scalable for flipping portions of each unit or an entire course. One of the major factors in course redesign is the time it takes to do it well. We recommend pilot testing the the flipped model with a single class before engaging in a complete redesign. In which class sessions do you currently have an in-class activity that you rarely have time to complete during class and requires the students to apply their knowledge and skills? What concepts or topics do students struggle the most to understand, based on exam scores and/or assignment grades? On what topics would students benefit from the opportunity to apply concepts under your expert guidance in the classroom? 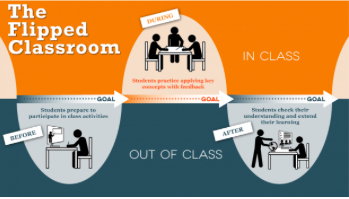 UT instructors share how they adapted to the new roles they play within the classroom and helped students adjust to their new roles within the flipped class. 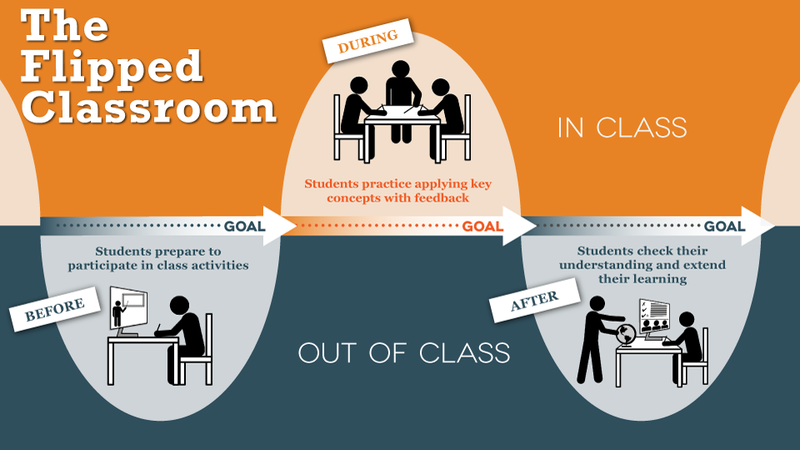 UT instructors share how they developed in-class engagement structures that leverages the power of the flipped class. What do I want my students to know and be able to do as result of completing this sequence of the course? How does it fit into the bigger picture of the unit and course? What part of the current "homework assignment" could be moved inside of class to help students practice applying the content? What in-class learning activity is being rushed because there is currently not enough time to do it well? What practice do students need inside of class to prepare them for the larger assignment that will be completed after class? Will students make the connection between what is happening inside of class and the assignment they are working on after class? What content do students need to know before class to successfully engage in the learning activity during class? The after-class portion may consist of a wide variety of activities including completing the work started in class or reading deeper about the topic or working together on a larger assignment that extends several class periods or practicing on one's own. Keep in mind that the after-class portion from the last class occurs at the same time as the before-class portion of the next class, so helping students manage the workload is important. UT instructors share how their course learning outcomes helped them make connections between in-class and out-of-class engagement. Provide students a way to pose questions about the content they are learning outside of class. UT instructors explain how they developed structures for students to engage in course content before class by either creating their own materials or curating what already exists and placing it online. How will the content and skills learned before and during this class prepare students for extending their learning after class (e.g. finishing the problem set, starting work on a project or a portion of an assignment, building upon what was begun in class to delve deeper into the topic, practicing alone or collaborating with peers, etc.)? Use discussion boards or academic social media to elaborate on ideas developed inside class. Present additional problems (on Canvas, course website, or from the textbook) for students to gain further practice on their own outside of class. Online assessment systems can be used to provide immediate feedback to students. Create assignments that require students to take the skills and knowledge developed in class and apply it in a new way or to a new situation not covered in class. Assign additional readings that further expands upon the concepts discussed in class. Encouarage students to create informal learning groups. Develop a peer-led undergraduate study where students come together once a week to work additional problems that expand upon the concepts being learned in class. Contact us to request a consultation about how to flip your class to bring more active engagement and collaboration into your classroom. Whether you want to flip one class session or an entire course, the following questions will help guide you through the essentials. 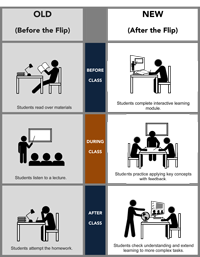 This infographic shows a typical sequence of learning opportunities before, during, and after a flipped class. This table shows the differences in the student experience of a traditional and flipped class. Instructors who are flipping their class often describe the impact of this shift from the traditional classroom to the flipped classroom.